« What Year-Round Homeschooling Looks Like! 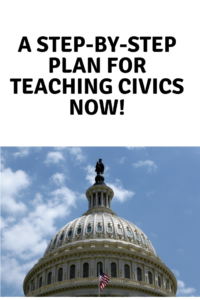 When should you teach civics? For public school teens, it’s often a semester course in their senior year. They’re almost voting age, so that makes sense. But what about homeschoolers? It often happens when there is interest in learning more, and with two legislative bills currently threatening homeschooling in California, this is an excellent learning opportunity for the entire family. It probably wasn’t in your plans for this year, but it’s always easier to learn when there is a reason. You can teach your teen how to be a knowledgeable citizen by using real life instead of a textbook and you can learn with your child! Here are some suggestions (for younger children, adjust to the ages and interests of the child and perhaps skip to the educational activities and game links). High Schoolers and parents should start by finding AB2756 and AB2926 online. 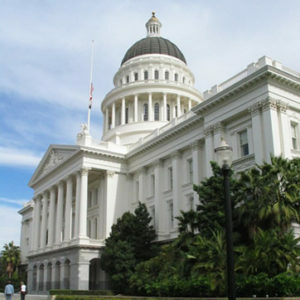 Both of these bills are targeting California homeschoolers this year. Read them line-by-line, and discuss them together. You’ll see the current code as well as new wording in blue. The blue parts are the suggested changes. The red parts indicate wording that has been removed by the bill’s author. While you are on the legislative page, you can sign up to receive emailed updates for any changes. See “track bill” at the top of the page. There’s a new “comments to author” box so your family can write a comment together! Learn who your State Assemblyperson is. You can contact the authors of bills as well as your Assemblyperson to let them know you are opposed to these bills. It can be by letter, email, phone call or in person. It’s a very powerful experience to learn that you have a voice and a right to be heard. Encourage teens to write their own letters. If you write, let your children proofread. You will be modeling activism that they’ll remember as adults. 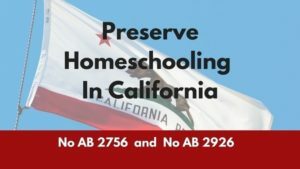 Let your children watch you sign the online “Preserve Homeschooling in California” petition and watch your name scroll on the list of recent signers. Check back every day or so and watch the number of signers grow! If you decide to attend the Education Committee hearings on April 25th, join the Sacramento Meet Up Facebook group to learn what others are doing and to share tips on how to get there. Children are welcome to attend and many parents will use it as an educational Sacramento field trip! If you’re registered to vote, let your children know. If you’re not, consider registering online with your children watching. AND, if you have a teen who is 16 or older, they can now pre-register to vote thanks to the new “pre-register at sixteen. 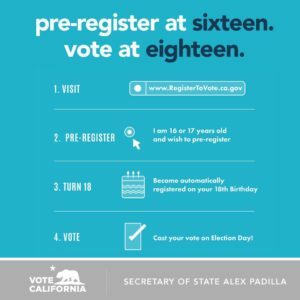 vote at eighteen” early registration! With so many resources and an important reason to learn, suddenly a subject that is dreaded by some becomes very important and fascinating! Written by Karen Taylor, posted on 11 April 2018 at 9:08 pm, and filed under Homeschooling, Teens. Bookmark the permalink.